thoughts on photography, life, new york city, etc. This is the first time that I can ever recall flying up the Hudson River when coming into New York City's airspace en route to LaGuardia Airport. 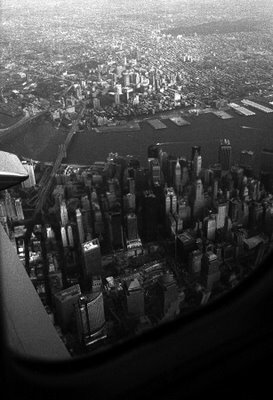 I'm accustomed to flying along the east side of Manhattan, above the East River. Fortunately I was seated on the right side of the airplane and had this view straight down into The Pit. This is actually looking out the window of the passenger who was sitting behind me.